If there were going to be a theme for this year’s ASLA Student Awards, it might well be sea change. A shift is palpable in the way students now seem ready to fully embody their roles as future leaders. There was great assurance in this group of award winners and a courageous willingness to tackle complex and difficult problems. The ambition of student projects leapt forward on multiple levels, with many submissions seeming to overrun the confines of traditional award categories. Projects as small as Chicago’s Jazz Fence, a Community Service winner, and as grand as the Award of Excellence winner in Analysis and Planning, El Retorno a la Tierra, which called for a total rethinking of the post-Hurricane Maria recovery of Puerto Rico, exemplified the deeply researched and carefully calibrated impacts of landscape architecture at its best. Projects ranged with authority across borders both political and cultural and did not shy from confronting the politics of place head-on. Jurors admired that “there are a lot of intense sites,” and projects were moving far away from conventional places that students had studied in the past. And then there was the sea itself, a changing condition that appeared in many submissions, particularly in the Analysis and Planning category. With water and aridity in all its forms at the center of so many projects, it was clear that accommodating sea-level rise and climate change is no longer a choice to make but a condition that is baked into students’ design thinking. Submissions also exemplified full engagement with social issues once seen as far outside the profession’s purview, such as prison yards, nuclear plants, and a landscape approach to the reunification of Korea, which garnered an Award of Excellence in Communications. During the lively deliberations, jurors commented more than once about the remarkable initiative of this year’s students, particularly the “complexity and depth of issues they chose to tackle,” as well as how much they looked forward to hiring this next generation of landscape architects. A spoiler alert: Among the ASLA Professional Awards, Brooklyn Bridge Park brings home the top honor in General Design, the Award of Excellence. Having taken shape over nearly three decades, the vast waterfront park, by Michael Van Valkenburgh Associates, came almost fully into being this year, a dogged vision for turning an old world into another one. And look at the results. This winner and many others show the long game of landscape architecture. As always, the digital edition of the September 2018 Awards issue is FREE, and you can access the free digital issue of the September LAM here and share it with your clients, colleagues, and friends. You can also buy this issue of Landscape Architecture Magazine at more than 700 bookstores, including many university stores and independents, as well as at Barnes & Noble. 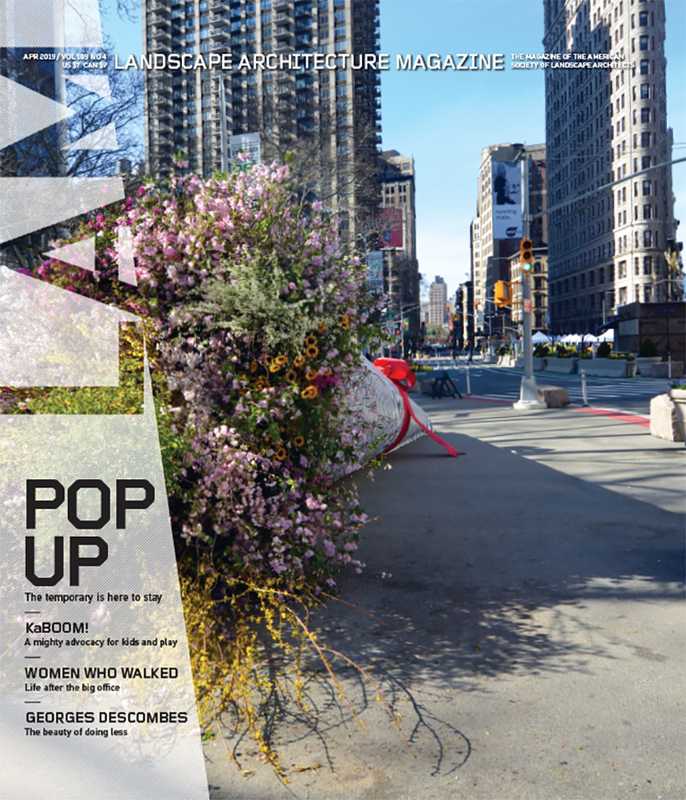 Single digital issues are available for only $5.25 at Zinio or you can order single copies of the print issue from ASLA. Annual subscriptions for LAM are a thrifty $59 for print and $44.25 for digital. Our subscription page has more information on subscription options. Credits: “Myth, Memory, and Landscape in the Pyramid Lake Paiute Reservation,” Derek Lazo, Student ASLA, and Serena Lousich, Student ASLA; “In Between Walls,” Niloufar Makaremi Esfarjani, Student ASLA; “Stop Making Sense: Spatializing the Hanford Site’s Nuclear Legacy,” Kasia Keeley, Student Affiliate ASLA, and Andrew Prindle, Student ASLA; “Korea Remade: A Guide to Reuse the DMZ Area Toward Unification,” Jiawen Chen, Student ASLA, Siyu Jiang, Student ASLA, and Xiwei Shen, Student ASLA; “Iqaluit Municipal Cemetery,” TSC Photography; “Chicago Riverwalk: State Street to Franklin Street,” © Kate Joyce; “Brooklyn Bridge Park: A 20-Year Transformation,” Julienne Schaer. Structured as a series of lectures on the past, present, and future of Los Angeles, the Third Los Angeles Project, presented by Occidental College as part of a seminar taught by Christopher Hawthorne, an adjunct professor and the architecture critic of the Los Angeles Times, continues a series that began last year. The seminars challenge attendees to think critically about this city in transition. The video above is from the first student-led seminar that took place on April 6, which focused on the increasingly conspicuous problem of homelessness in Los Angeles. Experts in public policy, construction, academia, and journalism discuss the issues surrounding the rise in homelessness, and suggest ways forward for combating its record high.